4 to 6 small juice mangos (available in Kerala) or 2 medium sized ripe mangoes peeled and cubed. 1. If using the juice mangoes, peel the skin and use whole mango. If using any other variety mangoes, peel, chop them into pieces. 2. In a thick bottomed vessel, add mangoes, turmeric powder, red chilli powder, salt to taste, little water, mix well and bring to a boil. If using the juice mangoes, you can pressure cook them till you hear 2 whistles. 3. 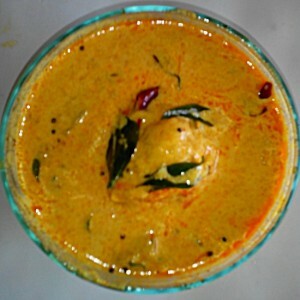 Grind all ingredients listed (coconut, green chillies, jeera, curd) into a fine paste. Grind without adding water. 4. When the mango is cooked, add the paste to it. Reduce flame and bring to boil. Be careful not to have the curd split. Stir constantly. If necessary add water to get the required thickness. 5. Heat oil. Add mustard. When mustard starts to splutter add remaining tempering ingredients. Pour the tempering over the curry.